Residential air conditioners operate off the single-phase alternating current supplied by electric utilities. Single-phase motors in applications like air conditioners use capacitors to provide additional torque for starting and to use less electricity once they are running. The motors have both start and run capacitors, which make them more efficient. 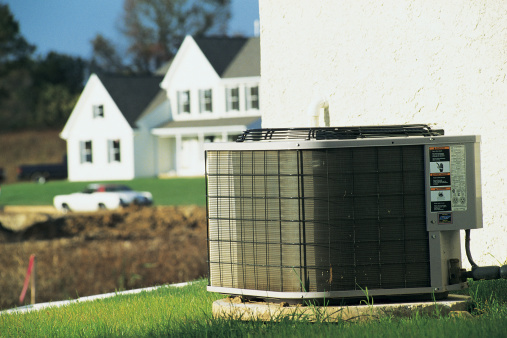 Residential air conditioners use capacitor-start capacitor-run motors. Capacitors store electricity. A fully charged capacitor allows current to flow at its maximum level as it releases its charge. As the capacitor discharges, the voltage rises until the current is at a minimum and the voltage is at a maximum. The voltage therefore is out of phase with the current. Without a capacitor, the voltage and the current are in phase -- as the voltage rises, so does the current. A capacitor shifts the voltage out of phase with the current such that the voltage lags the current. Electric motors require a rotating magnetic field supplied by an electric current that rotates ahead of the rotor's magnetic field. The rotating magnetic field pulls the opposing magnetic field of the rotor, which causes the motor shaft to spin. A motor needs two magnetic fields to start, but a single-phase alternating current can only supply one field. Each field has two poles, north and south. The single-phase motors used by air conditioners need a strong, additional field to start under the load of the compressor. Without the additional field, the motor hums, but won't turn. A capacitor placed in line with a second, auxiliary motor winding, causes the voltage of the winding to lag the current. This sets up an additional magnetic field which is out of phase with the field in the main winding. As the alternating current rises, falls and reverses itself, the fields rotate between the motor windings and the rotor starts to turn. The capacitor that starts an air conditioner motor handles a high current flow to give the motor the torque required to start it turning. Once the motor speed approaches full speed, a switch disconnects the starting capacitor. Once the switch disconnects the starting capacitor, the air conditioner motor loses the extra magnetic field that was supplied by the starting capacitor. A larger motor could easily keep turning without the extra field, but it uses more electricity and is less efficient. A smaller capacitor still provides the phase shift needed to provide the additional magnetic field, but uses less current. This run capacitor is always connected to the motor's auxiliary winding to provide the phase-shifted magnetic field, which allows the air conditioner to use a smaller, more efficient motor.